The complex improvised songs of the black bird who lives in forests and cities all over Europe is the inspiration for this work. Bird is an interactive audio-video installation in which a virtual bird, which moves in an 8 channel space, composes algorithmic songs based on recordings of black birds. The position of the visitors in the space is made visible in real time through the video projection by way of trail masking. The movement of the viewer influences the location of the sound of the virtual bird. 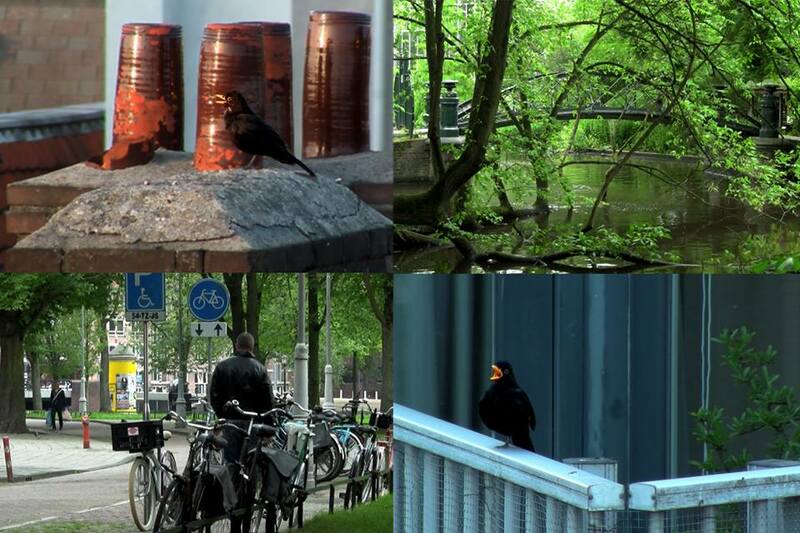 This encounter between the urbanite and the sophisticated melodic and timbral structure of the song of the black bird posits it as signifiers of nature in an urban context while providing proof of the cultivation of virtuosity amongst animals. The American duo Marlena Novak and Jay Alan Yim form the collaborative platform localStyle. In their intermedia projects they explore how thresholds and boundaries are constructed, interpreted, and negotiated, via themes as varied as the mating behavior of hermaphroditic marine flatworms and the sonification of electric fish from the Amazon. For this project they collaborate with Jesus Duran, an exprimental technologist and educator who explores in his work the transgression between virtual and physical space in social feedback circuits.